We will add more footage and pictures later, but here the whole terrace has been demolished, the pool surround demolished. 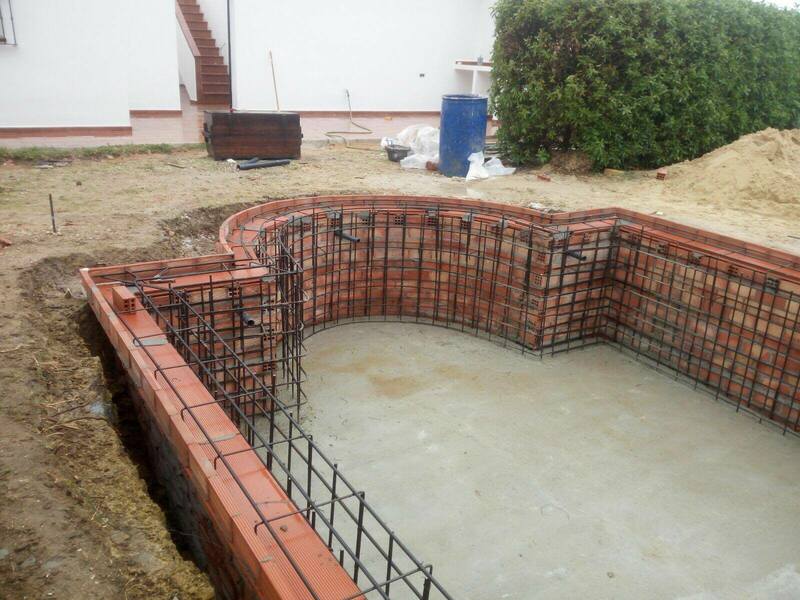 We levelled the swimming pool, made a whole new pool surround, new terrace made from reinforced concrete, new walls around the pool, with lighting. The cascade is stunning, creating a relaxing focal point at the head of the pool. Add a cascade to your pool for that ultimate finishing touch. 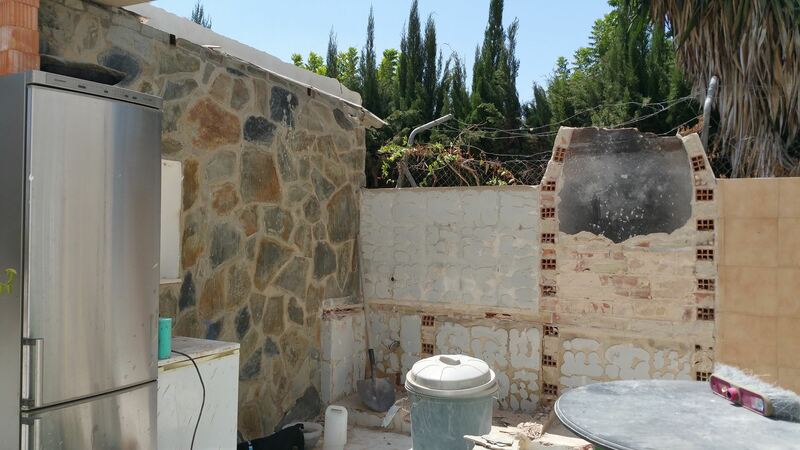 A before and after picture of a swimming pool tiling & renovation project in Mijas. In the before picture, the pool doesn’t really look that bad, but it was a very boring colour of blue, with the stereotypical dolphin and Greek key border. There was no personal touch, that the clients could be proud of. The pool was leaking through the pipe in the base of the pool. Excavation of the terrace to get to the pipe was impossible, as the terrace is stamped concrete and difficult to repair. 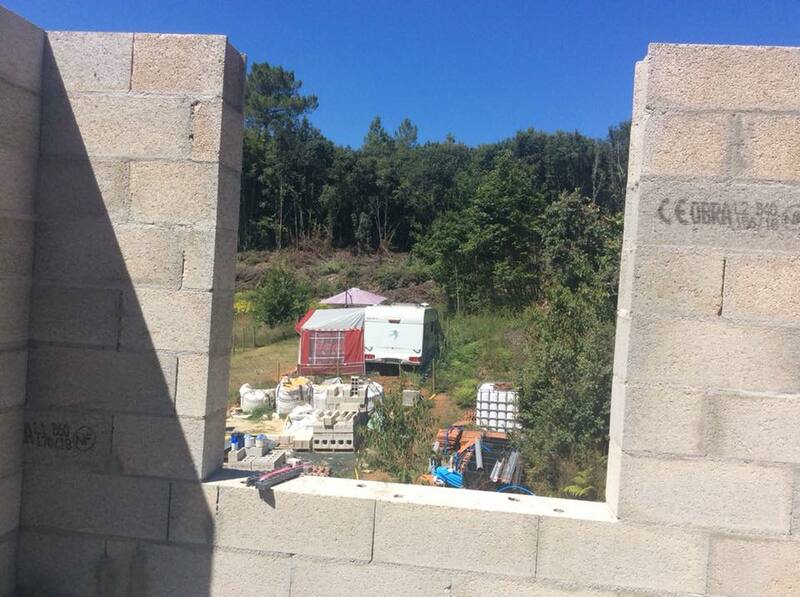 However what made the work impossible (without tens of thousands of euros) is that the pool is supported by a retaining wall 5m high, on top of which is a concrete ring beam and then the terrace. Excavation in this area would have disturbed the ring beam and the retaining wall. Instead, we re-purposed the hoover pipe to give a working drain. The pool can be hoovered using the skimmer, so not a problem. 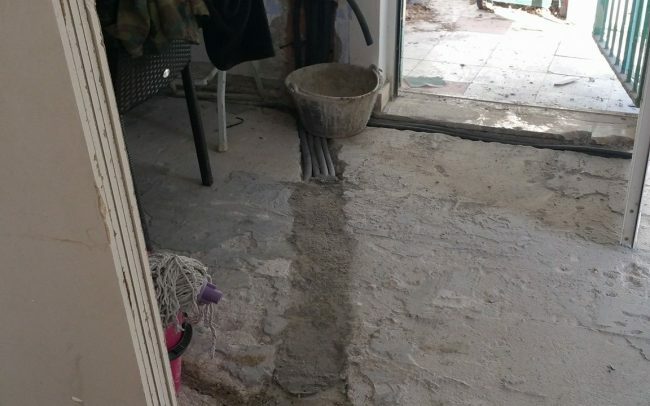 We did suggest that the most economical option would have been to simply block the drain off, but as the owner wanted to tile the pool to his liking, it made sense to make the repair. The tiles chosen are a beautiful turquoise glass mosaic. 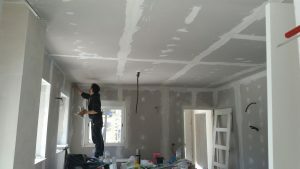 Interior plastering and plasterboard, Coin, nr Marbella. This beautiful country house is in the hills above Marbella on the way to Coin. 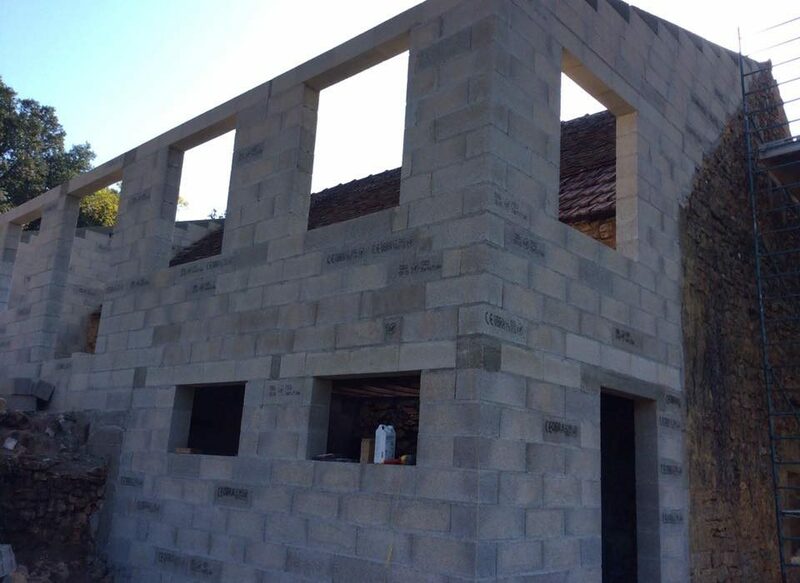 In this post, you can see the progress that our building team has made on the interior of the property. The house was very old and had constantly had new parts added and so none of the rooms had straight walls or ceilings of the same height. 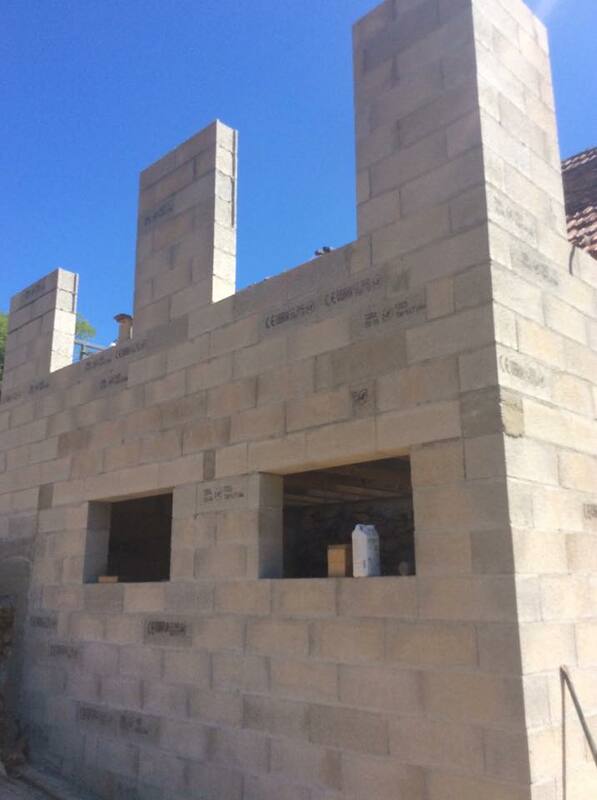 In this part, which will be the lounge, we have removed columns, chimneys, false ceilings and stone cladding. 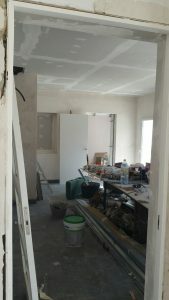 We have then installed the plasterboard on all walls and ceiling. 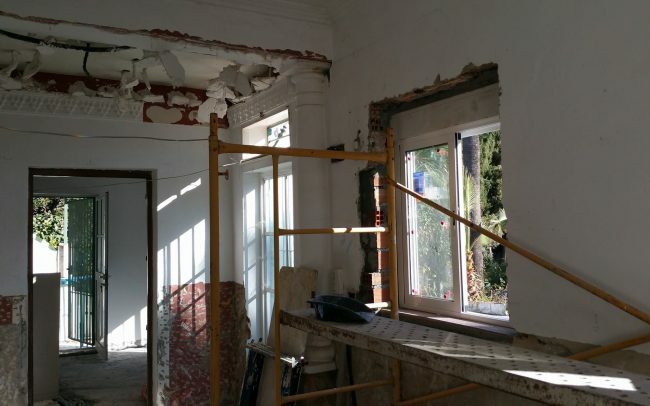 This will mean that where there were 2 rooms with several different finishes and different ceiling heights, there is now one type of wall and one level of ceiling. 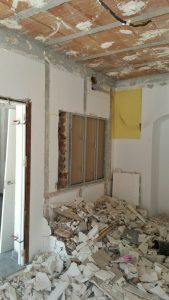 There is a cavity between the plasterboard and the original walls, so this will give added insulation. All the floors will have the same slate grey tiles throughout. 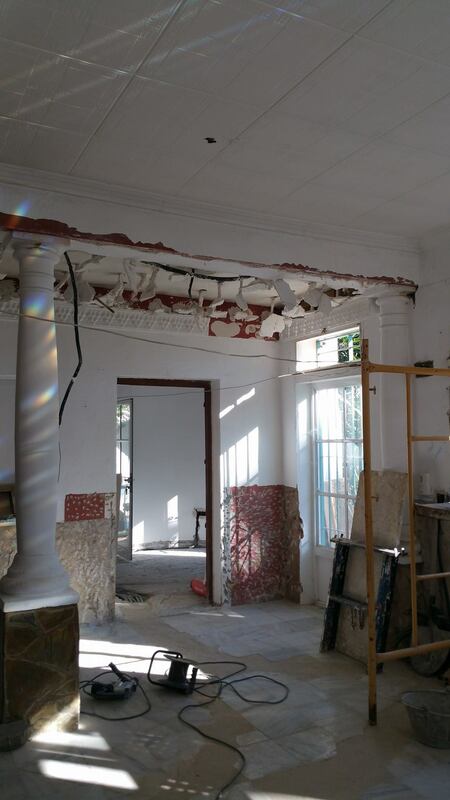 In the adjoining room, we have started to strip out the ceiling and this will get the same treatment. 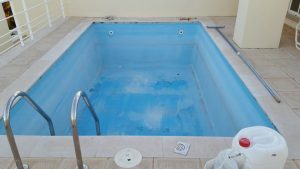 We line swimming pools with gelcoat and fibreglass in most areas of the Costa del Sol, Nerja, Velez-Malaga, Torremolinos, Fuengirola, Mijas, Marbella, Estepona etc and inland areas such as Coin and Alhaurin. The fibre glass lining of a swimming pool is a fairly quick process, resulting in a fully waterproof pool structure that will give a modern clean look, whilst being easy to maintain. Fibreglass or polyester lining is more economical than other finishes. The polyester is a long lasting, hard wearing surface, reducing the build up of cal and algae due to its water repellent properties. The polyester is 100% waterproof and has a certain amount of flex, making it a good product for waterproofing structurally flawed pools. 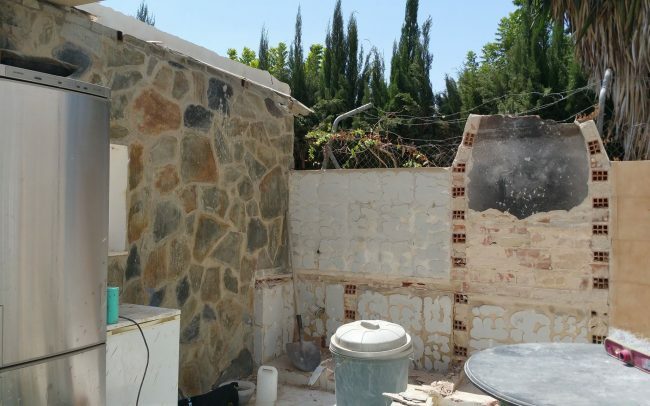 It can either be left as the finished surface, or be treated to allow tiling. It can be applied directly over painted, tiled or other finishes, as long as the substrate is reasonably smooth. It is not necessary to change any of the fittings in the pool, thus reducing cost. Preparation of the surfaces. The pool needs to be clean and dry when the team arrives on site. 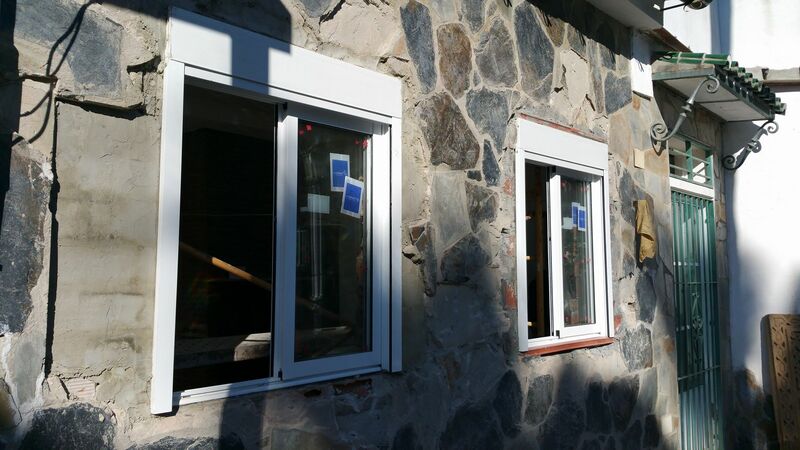 The products can not be applied over damp surfaces. 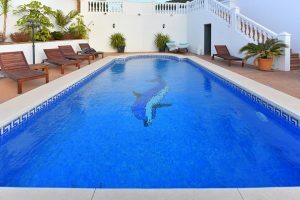 Tiled Pools – If the grout is reasonably good, the polyester can be applied directly over the existing tiles. 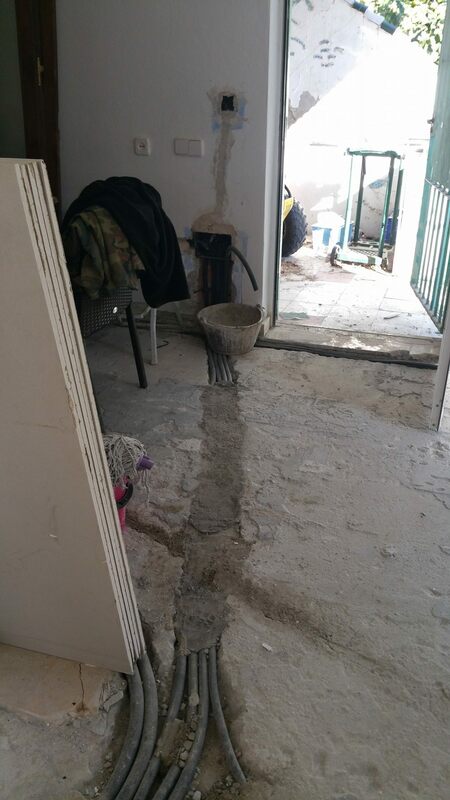 If the grout is in very poor condition, or missing, it will need skimming with 52.2 cement. 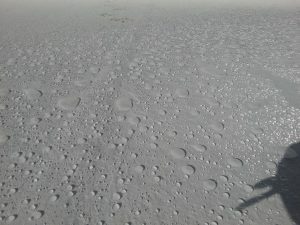 Painted Pools – Any loose or flaking paint needs to be removed. In areas where the paint is very thick and uneven, this will need to be ground smooth. 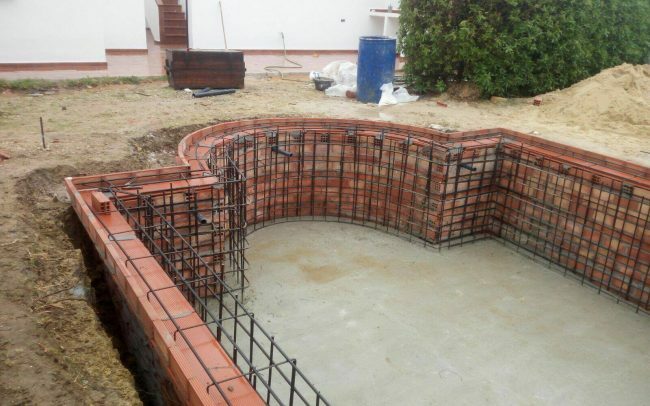 If the pool has very square corners, these should be rounded with a sand cement mix, as it is very hard to fold the matting into the corners. This can be seen in the link below. We apply 450gms/m2 of chopped fibre matting. Approximately 1kg/m2 tixotropic resin and finish with high paraffin content gelcoat, in white. Fittings are masked. 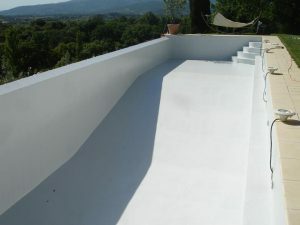 It is possible to tile over the fibreglass (if the pool is of concrete or block construction), either immediately, or in the future as budget allows. In order to apply tiles, the final layer of gelcoat is treated to provide a bond for the tile adhesives. Once the resins have set, the masking can be removed and the edges sealed with polyurethane. After this, the pool needs about 3 or 4 days to dry before filling up. We recommend that the finish is in white, as it is the most hard wearing. 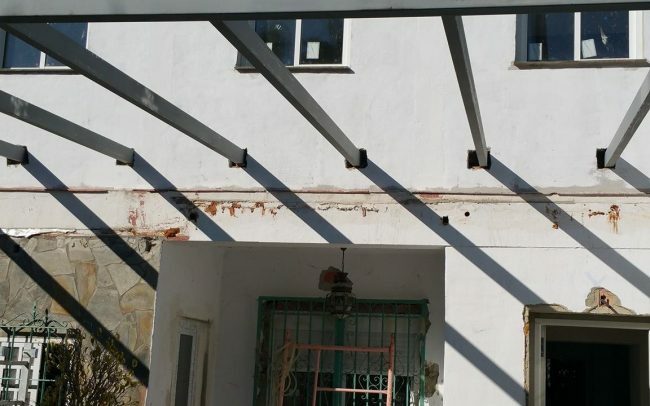 As part of the buildings works on this house in Ronda, the clients wanted a finish that complimented the surroundings and didn’t want just render and paint, which is the usual finish on houses built in Southern Spain. 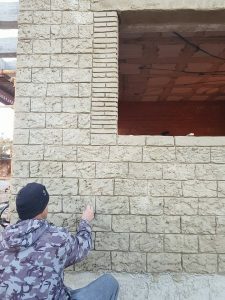 Building with stone is expensive and time consuming and it also makes complying with energy certificate requirements as it is more difficult to insulate. 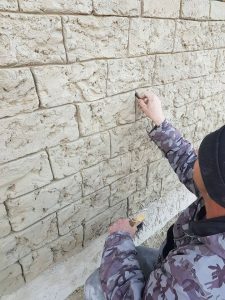 Here, one of our skilled builders is hand finishing the render to create a stone effect, hopefully it will be to our clients liking. 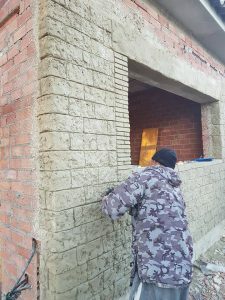 The cement render is applied by hand, then using special stamps the base effect is established. the final detail and colouring is done by hand. We have used this process before in gardens and around swimming pools. 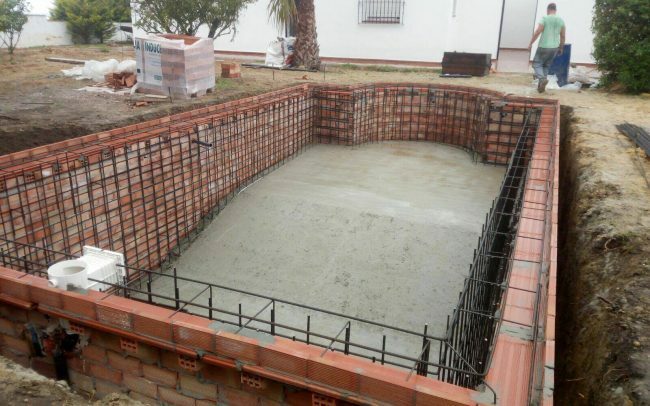 We have vast experience in the renovation and construction of swimming pools. For new swimming pool constructions, the most time consuming thing is the paperwork. 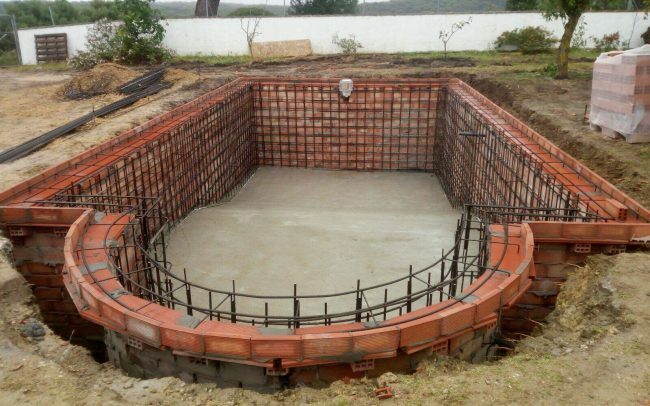 The actual construction of a concrete swimming pool takes us about 2 weeks. 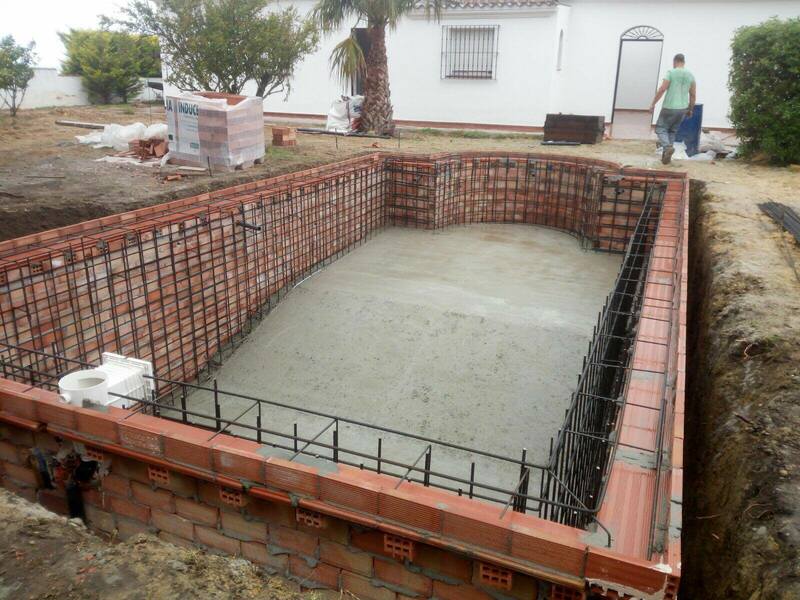 The first step in the construction of the swimming pool is to retain an architect. The architect will draw up plans and submit these for approval. 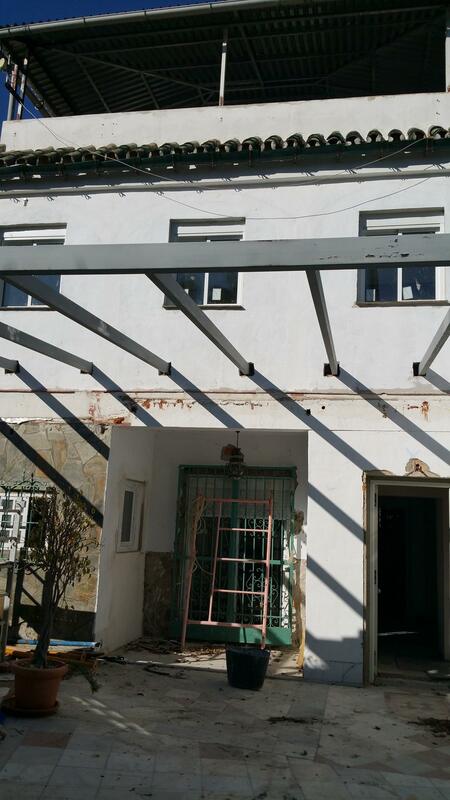 Once the plans have been stamped, we can move on to applying for the building license. This can take any where from a few weeks to 12 months, depending on the area. When the paperwork is completed and approved we can break ground. 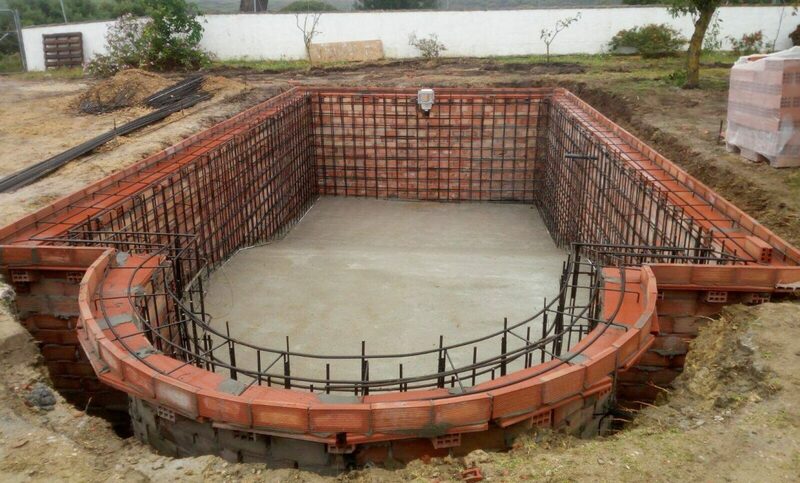 We favour sprayed gunite concrete for small domestic pools. 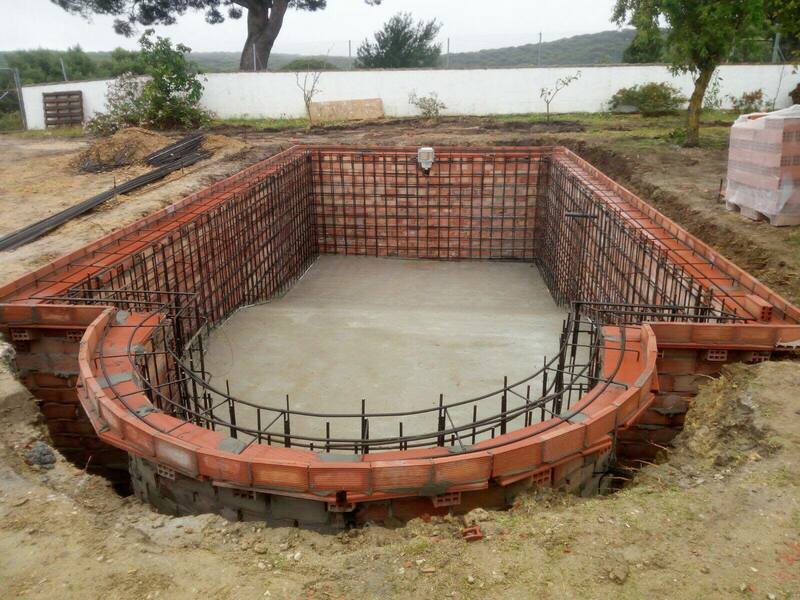 The pool form is excavated to the required dimensions, and brick shuttering is built. Once this is in place, steel reinforcing is put into place, along with the pipes and light buckets. 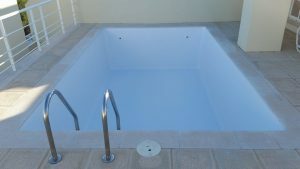 After this we cast the white marmolina swimming pool surround, render the walls and tile with glass mosaic gresite. The joy of purchasing a home on the Costa del Sol, is that you are able to put your stamp on it and make it truly personal. 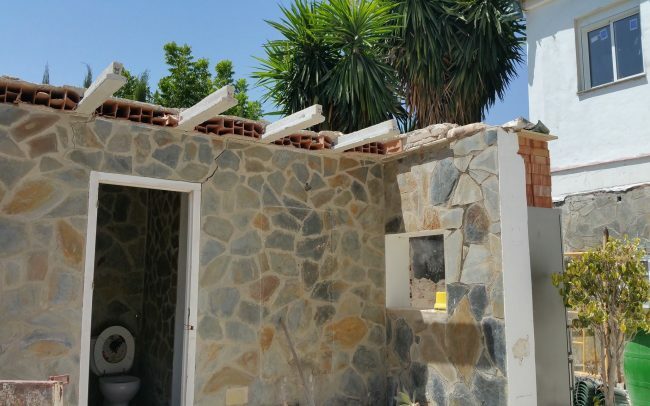 Renovating or reforming an existing finca or villa is a way of doing just that. It allows yo to get the finish that you want from your swimming pool area, terrace and interior living spaces. Planning the schedule of works is the first step. 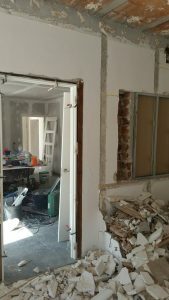 We will not only discuss your immediate plans, but also your future plans to ensure that no unnecessary works are done and that no extra cost is incurred in the long term. 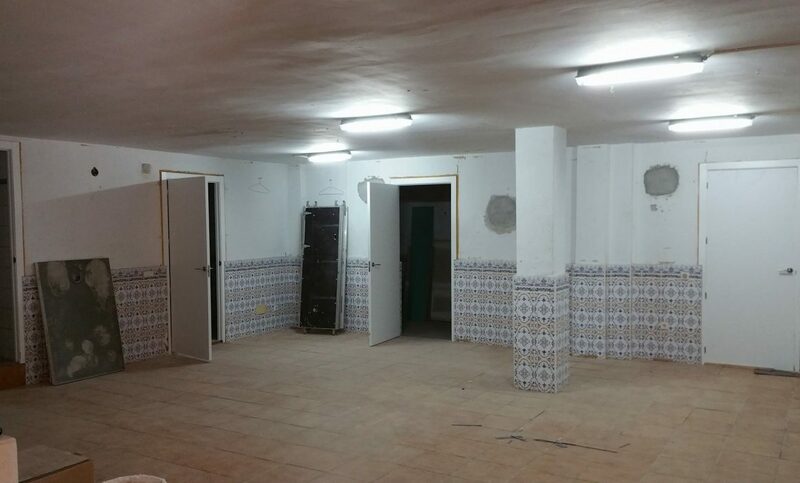 Part of our service can include the application for the correct licenses from the town hall (ayuntamiento), whether it be small works (obra menor) or major project (obra mayor). 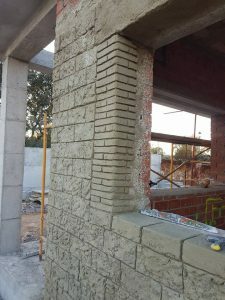 In general, for an obra mayor an architects project is required. 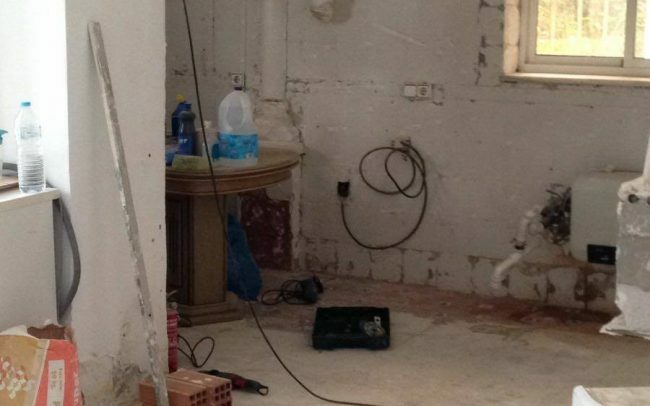 Our team of specialists includes architects, plumbers, certified electricians, tilers, painters.. we have it covered. 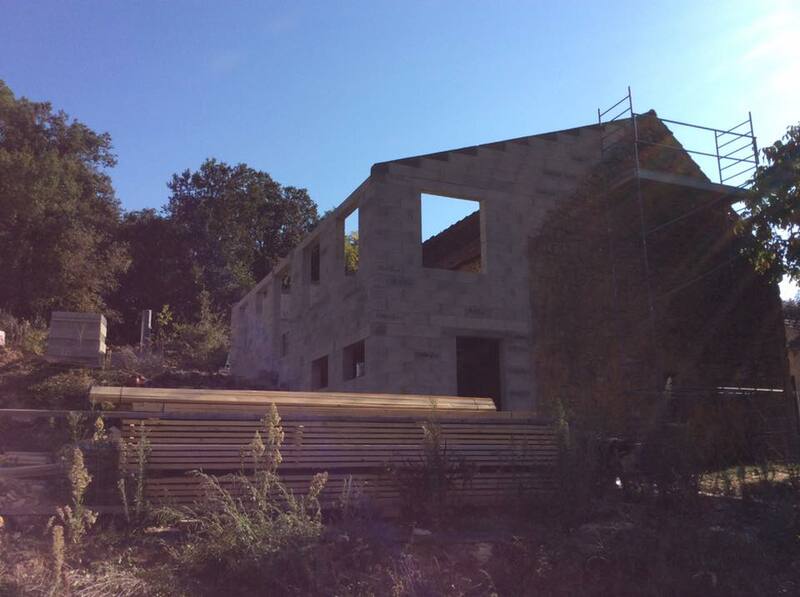 In this example, the project was of a huge scale, taking just under 6 months to complete. 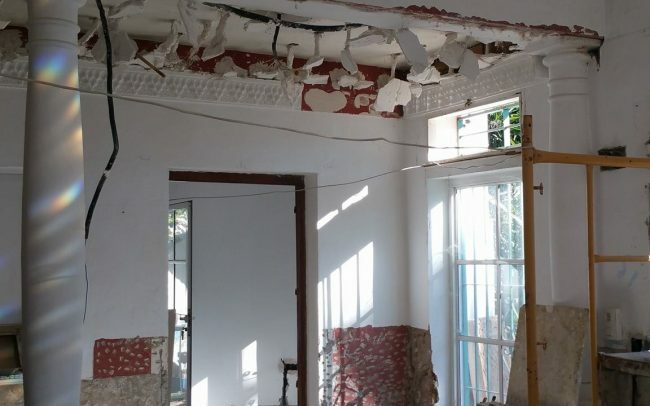 The entire home was stripped out down to bare walls and floors and then started again. This included all the electrics and plumbing. 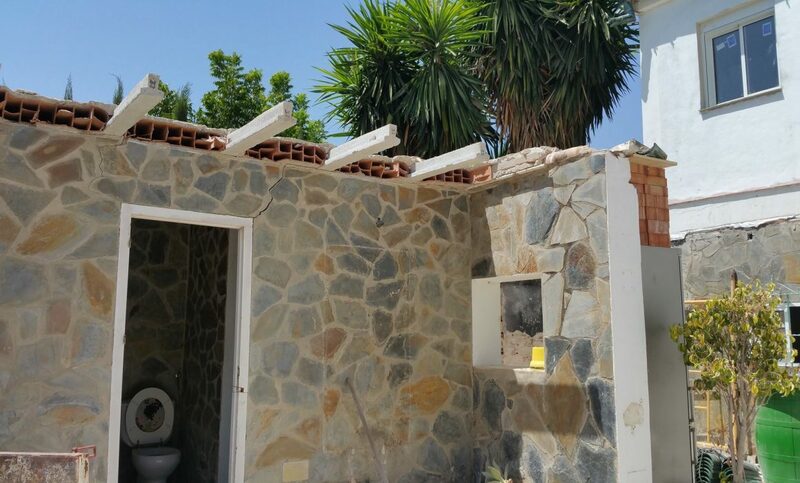 The villa was completely rewired and supplied with a new Boletin (safety certificate required by the energy company). Some of the plumbing was not good as new pipes had been added, others blocked off etc.. so leaks would probably be a problem in the future. 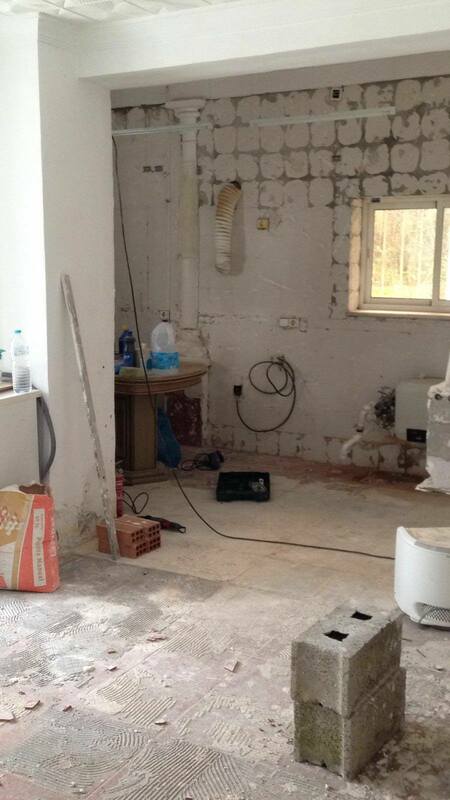 Each room was completely stripped out, rendered and plastered, then new high quality tiled floors put down. 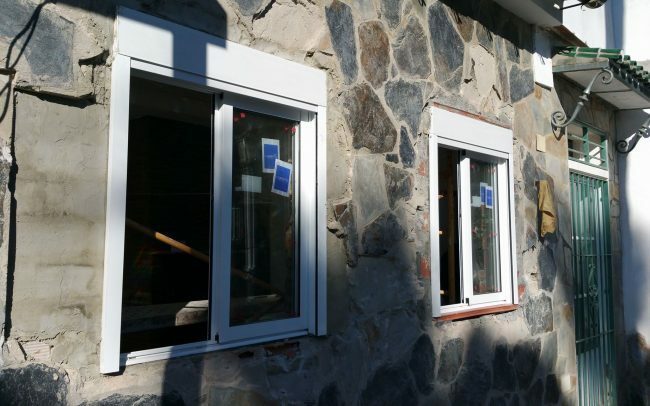 New windows and doors were installed. Here are some progress photos, in later posts, we will post finished pictures and detailed descriptions of the building work involved. 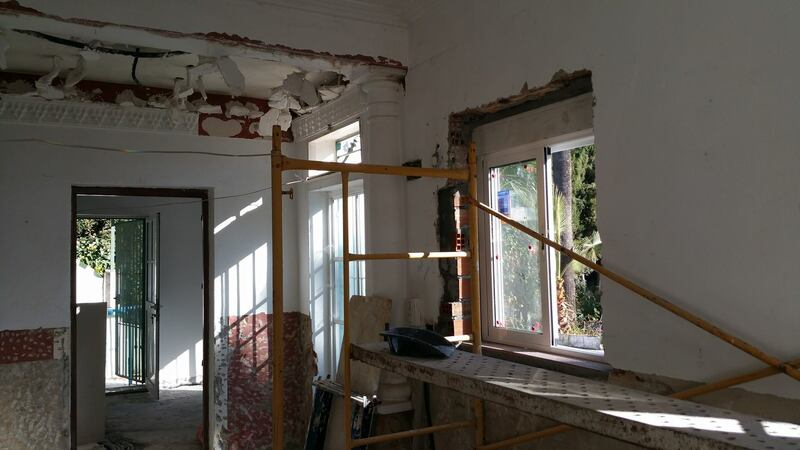 This is the first stages of a complete villa renovation in Fuengirola. 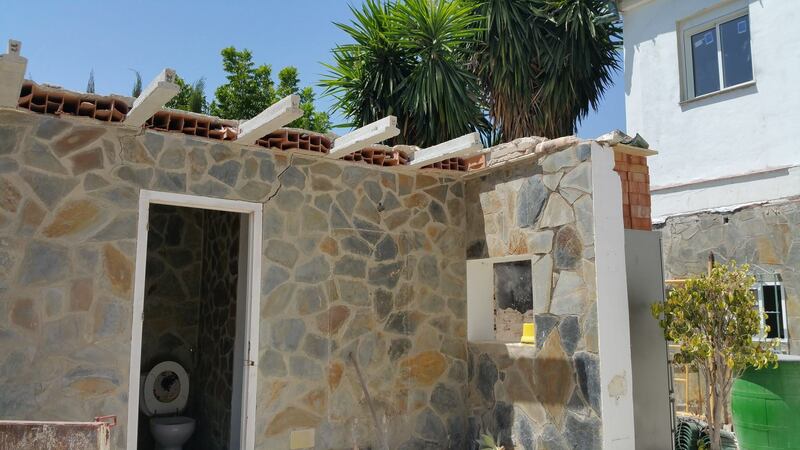 The villa will undergo a complete reform, but the work will be carried out in stages to ease the financial burden of the project and to give the clients relief from the building works (as the clients have moved into the villa now it is habitable). 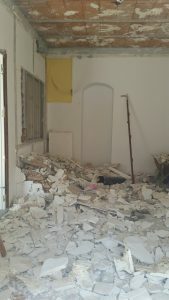 The first part of the renovation was carried out last year, renovating the interior, kitchen, bathroom, and living areas. 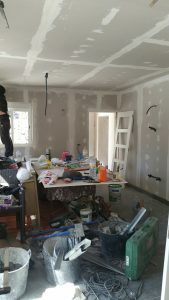 This was all plastered and painted and is a comfortable living space. 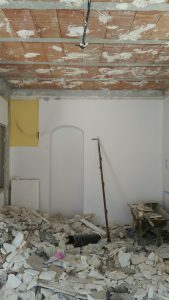 The second part of the renovation was what can be seen here. The pool was leaking, so has been renovated using a Renolit AlkorPlan 3000 reinforced pool membrane which completely seals the structure, with a 10 year warranty. In addition some minor leaks were repaired in the pump room. We have carried out some exterior painting with fine detail on the balustrade and replaced some doors and windows. 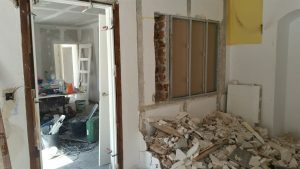 In the pictures you can see that work has started on the underbuild, The basement area will be made into a self contained apartment. We can be flexible and work to our clients needs and budget. 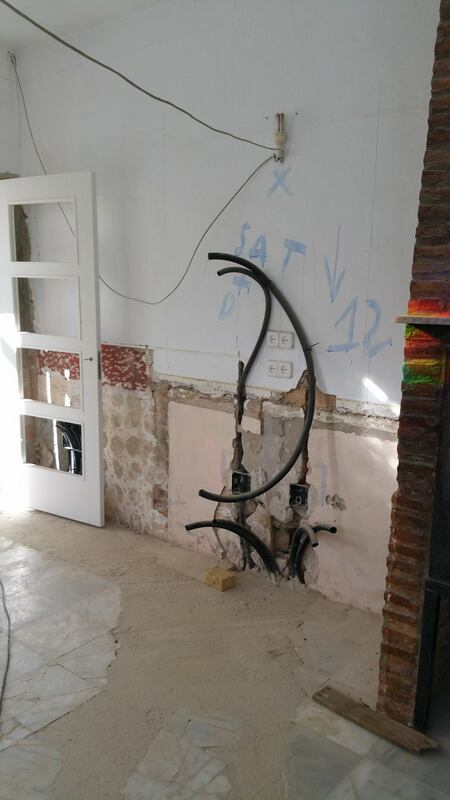 We have qualified electricians on hand that can rewire villas and apartments and provide the all important “boletin”, to be able to get electrical connection. 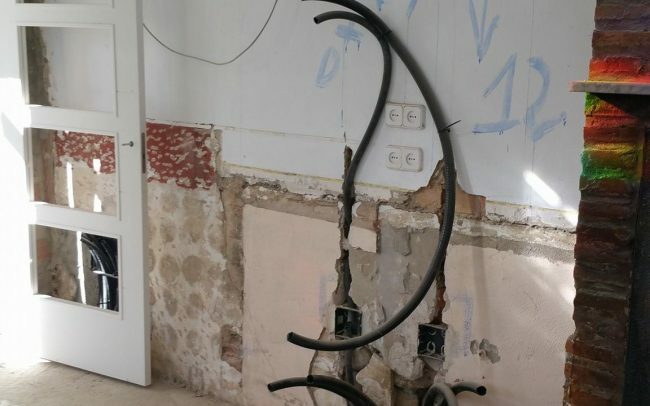 If major renovation works are done on an older property, it makes little sense to leave old cable under new finishes. As part of the rewiring, plug sockets, lights and light switches can all be put in more convenient places. 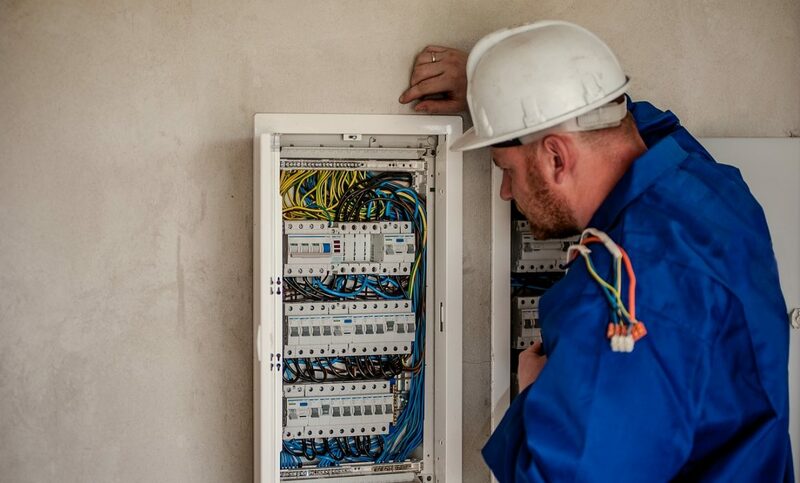 Cables and conduits can be run for existing installations and also allow for future upgrades such as air conditioning units, pool heaters, exterior lighting, automated gates. Part of our approach to building works is to think about future requirements as well, this often saves money in the long run.